Delight your senses and ignite your imagination. 26 guest rooms ranging from standard to deluxe have tranquil view of in house garden and very the beautiful foot hills of the Himalayas. Each room choices offer true relaxation. Decorated in different designs, our rooms exude elegant comfort and style. All of them include our signature Blissful Bed and a large bathroom to enhance the level of opulence. Relax and enjoy your stay in the living spaces designed to feel just like home. Your Deluxe Room includes one King Size bed with comfortable pillows, cushions, mattresses and premium bedding. We guarantee our duvets are laundered fresh for each new arrival. Sitting and work areas include two individual sofas with a dining table, desk with a Media and Charging Station, and a work chair. The room also consists of a huge balcony overlooking the foot of Himalayas with two rocking chairs. We now feature in all our rooms, Flatscreen HD TV's with satellite reception and complementary wifi access. 60’s Green Hills Deluxe Rooms will consistently meet your satisfaction for hotel room comfort and make your stay in Rishikesh pleasant and restful. 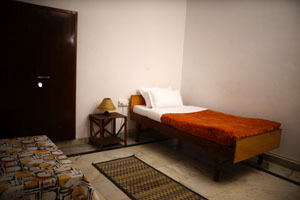 Specially designe d keeping in mind the needs of a budget traveler, these rooms have been thoughtfully designed with space efficient straight line furniture and comfortable beds. 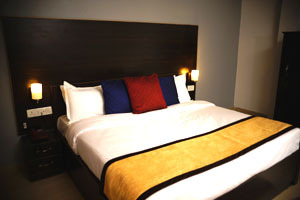 All standard room comes with a television enabled with satellite reception, sitting area, a dining table and a balcony. These single ro oms are the bestselling and our favorite accommodation type and can only accommodate one person. 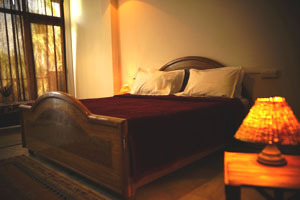 The rooms are well spacious and consist of single bed with bed side table and lamp, dining table and chair. These living spaces are equipped with an air conditioner and a geyser.These rooms also come with complementary wifi internet reception. The room also comes with a small balcony with a garden view.